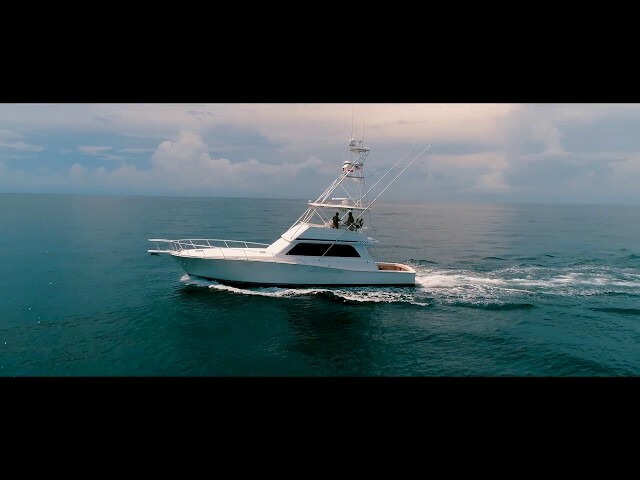 Blue Energy is a 53 ft Viking Sport Fish with three staterooms, two head layout and galley up with the dinette and salon on the same level which is a rare find. West Florida Yachts would love to guide you through a personal showing of this 53' Viking Convertible 1997. 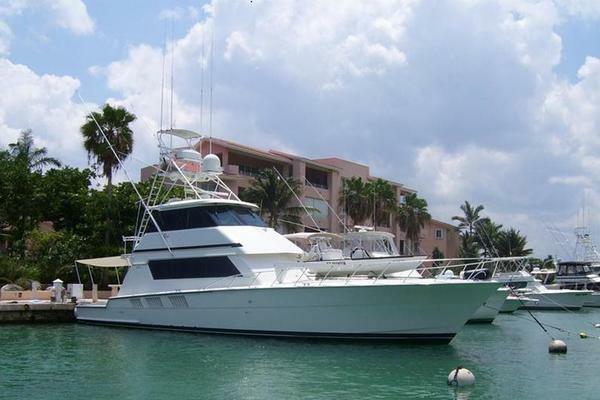 This yacht for sale is located in Stuart, Florida and priced at $290,000. For a showing please contact us by filling out the form on this page and we will get back to you shortly! Aft of the dinette along the starboard side is a wet bar with liquor storage underneath, an entertainment center with a Stereo CD/DVD, a 5 CD changer and an AV control receiver. There is a Bose surround sound system with subwoofer. Aft of the entertainment center is the ships main electrical panel and 24 volt generator remote start. The ships service is 12 volt 120/240 VAC. There is a 50 amp cable master in the cockpit. To port is the L-Shaped sofa in cream ultra leather. At the port forward end of the sofa is a built in end table with a subwoofer. Beneath both sections of the sofa is storage. To port is the curved galley area with Corian counter top. There is a 2 burner ceramic cook top concealed in the athwart ship section of the counter with a storage compartment built in for storage of the cook top cover. In the forward port corner of the galley area is a stand up refrigerator/ freezer. Just aft of the refrigerator is the molded Corian sink and single handled faucet. The floors in the galley area are teak and holly (new). There is more than adequate storage under the counter area. In the forward windshield area cabinets which start in the galley area, there is a microwave/convection oven. Forward above dinette is a large flat screen color TV. To starboard is the L­-Shaped dinette with a pale butterscotch Ultra-leather covering and a bright teak table top. There are blinds throughout the galley, dinette, and salon area. There is full storage under the dinette seating. Across and to starboard from the guest/crew stateroom is the master. The master stateroom features a walk around queen berth with two night stands and lamps. There are also two drawers in each of the night tables. Along the starboard hull side there are six storage drawers. All the way forward on the starboard side is a huge double door cedar lined hanging locker. To port in the master is a makeup counter/table with a stool. The master head is entered forward of the starboard hanging locker and has large shower with bi­fold glass doors, an extra large mirrored medicine chest and a molded Corian sink with vanity with adequate storage below. The head is an upgraded Vacu-flush and the floors are are vinyl. The VIP stateroom is all the way forward with a raised center line queen berth and port and starboard cedar hanging lockers. Along the hull sides on both the port and starboard are storage lockers. On the port side above the smaller of the two hanging lockers is a cabinet that has a 12 volt outlet and a cable connection for a small TV. There are also two drawers under the bunk as well as a locker. There is a Bowmar hatch in the VIP with a screen and privacy cover. All of the cabinetry is raised paneled teak and the carpet is beige with a basket weave design. Further aft Port side in the VIP is the laundry cabinet which houses a full size stacked washer and dryer. Aft and to port is the day/guest head which can be accessed from the companionway, VIP stateroom or the guest/crew stateroom. The head is an upgraded Vacuflush system with a molded Corian sink and vanity top, a mirrored medicine cabinet and clear Lucite towel racks. There is a large enclosed shower with glass bi­fold doors. The floors are vinyl and there is a large storage area under the vanity. Aft to port is the guest/crew stateroom with large over/under bunks that run fore and aft, and a hanging locker that also houses an electrical sub panel. There are two drawers under the lower bunk and there is an access door to the head. There is an independent digital A/C control. There is a large 150 sq. ft. cockpit with a transom door with gate and new bolsters. There are stern hawser pipes. To port there is fresh and saltwater wash downs as well as a quick connect fresh water supply for the boat. To starboard is a 50 amp cable master, a 30 amp connector, and a TV/cable connector. Under the starboard gunwale is a gaff holder and boat pole holder. Along the salon bulkhead, next to the engine room access is a bait prep center with a sink. Under the sink is a four drawer tackle storage area. To the port side of the prep center is the bait freezer. There is a live well in the cockpit sole aft and in the center. There are Rupp triple spreader riggers. The cockpit has a "misting" System along with a "fishing line center". There is a removable fish cutting table that fits into a pole holder and a fishing line center. The entire area has complete custom SeaDek covering system. Up the ladder to port is the flybridge and helm with full enclosure. The forward panels and the panels on each side are EZ2CY. The front center piece unzips for ventilation and clips to the hard top. Her hardtop is by Viking with built in electronics boxes. The helm is raised with electronics boxes across the front of the helm. All of the gauges are VDO's in the helm pod under glass. The flybridge area also is complete with new SeaDek custom flooring. The foredeck of the boat sports a full bow rail, pulpit with a Fortress anchor and Lawrence electric windlass. There are also three Bowmar hatches for ventilation in the staterooms. The cockpit covering boards, side decks and cap rail were repainted in late 2017 to keep her looking fresh. The engine room is accessed from the cockpit. Going into the engine room there are switches for the engine room lights and live bait well to port and switches for the circulating engine room fans and blowers to starboard. There are also two fire extinguishers located in compartments to port and starboard in the engine room access. To port, upon entering the engine room, is a 20 KW Onan generator with sound shield. The genset has 3,000 hours. On the aft engine room bulkhead, there is a Racor that is mounted in this area for the genset. There are emergency engine room pumps. The shafts have dripless shaft logs with two (2) backup seals mounted on the shaft as well as crossover hoses on the installation. On the starboard engine room aft bulkhead are two battery chargers. There are new double Racor's on both mains with service dates taped on to always insure good clean fuel and the ability to isolate one filter and still run on the other. The ZF Super Shift transmissions are ZF550 2:0 to 1 gears with upgraded controls and drip-less shafts. The engines are MAN 12 cylinder model D2842LF401 1000 HP (2,766 hours). Also located in the engine room is the Eskimo ice chipper, engine room closed circuit camera and the Sea Recover Aqua Whisper water maker that provides the conversion of salt water into pure fresh water free of any calcium or salt. No spots from a wash down with this water and a must for Bahamas cruising where water is typically 35 cents per gallon or more. From all indications, Blue Energy has been well taken care of over the years. Her interior and exterior are clean and neat. The decor is tastefully done and non-­intrusive. With the 1000 HP MANs, her cruise speed is acceptable by today's standards. With fresh interior including Audio Visual, Carpet and Galley Flooring and Window Treatments the Interior is perfect. The bottom was recently painted and all fluids changed, completely professionally detailed and lovingly cared for by fastidious owners with an eye for detail. This couple has put both heart and soul in taking this vessel to the next level. Why spend $1m+ for Sport Fish that looks like this one. This vessel at this price will sell very soon please contact us for more information.